Don't mess with loquats or Allen'll kick yer patootie. I took a botanical tour a few weeks ago with my friend Allen. He's a wealth of information on everything from Native American culture to welding to beekeeping to "what's wrong with my car." Every once in a while we'll jump in the car and he'll take me to see bees, friends' greenhouses, interesting houses he's discovered or outstanding tree specimens. This trip, we stopped to see an amazing mounded loquat tree, allowed to run all the way to the ground for ease of harvesting. Many times landscapers limb up loquats, training them to lofty (and hard-to-harvest) heights, but in this case, foresight was shown on behalf of its fruiting potential - which is obviously incredible. When we visited, the tree was in full bloom. My guess would be that the yield on this tree could easily reach 150-250 lbs a year, frosts permitting. 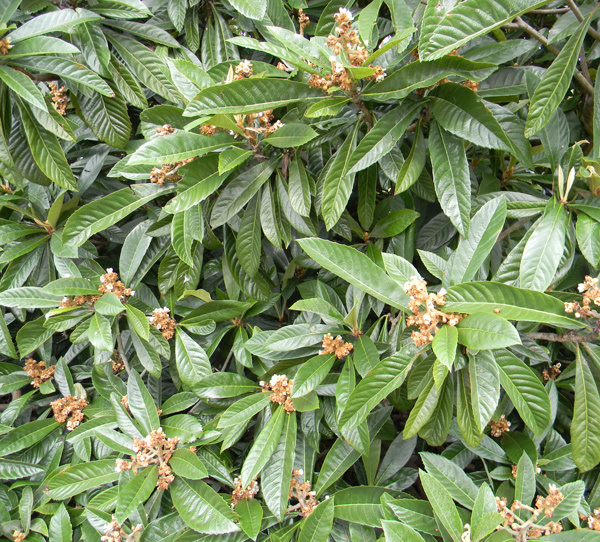 Though it's not native to Florida, the loquat grows excellently throughout the state, often naturalizing itself in the midst of oak forests and by the roadsides. 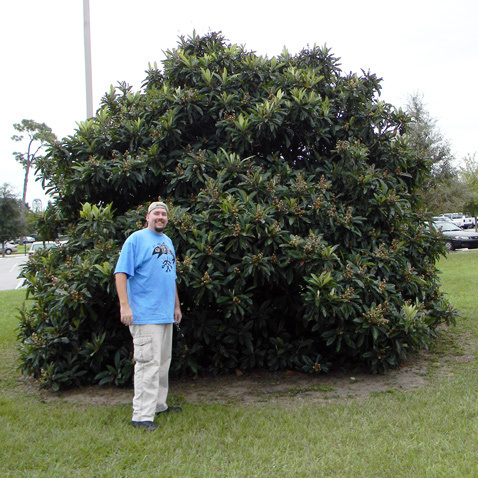 Allen related that as a kid, he planted half the loquat trees in Ocala, either directly or indirectly. The fruit is fuzzy, sweet-tart and contains a couple of large smooth pits inside. 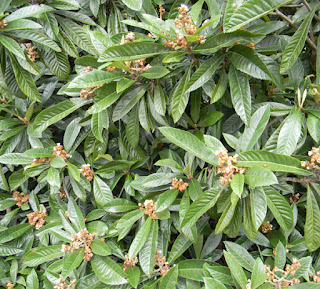 Because it has a short season and soft fruit, the loquat is almost never seen for sale except in cans at the Oriental market. 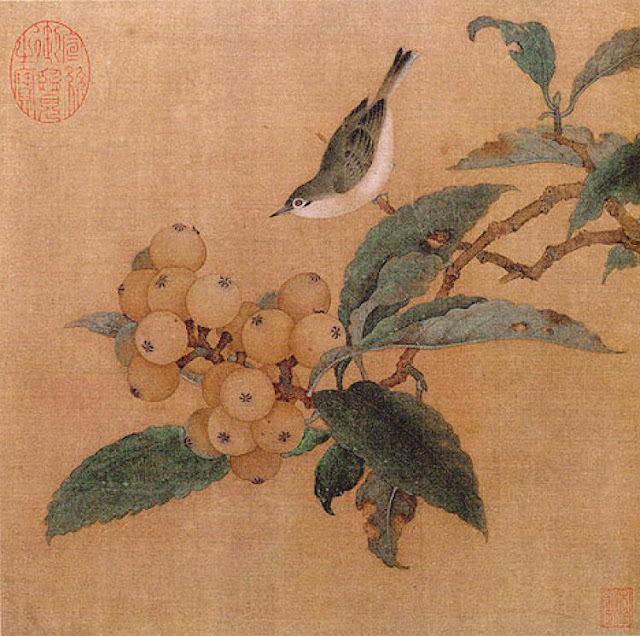 Which makes sense, because the Orient is the original home of the loquat. As for growing these babies, you can find them all over the place. From seed it'll take a while for you to get a fruiting tree, but many landscape stores sell larger trees at affordable prices. Interestingly, they're not usually sold as fruit trees. Instead, they're used primarily as easy-care landscape specimens. Typical American thinking. 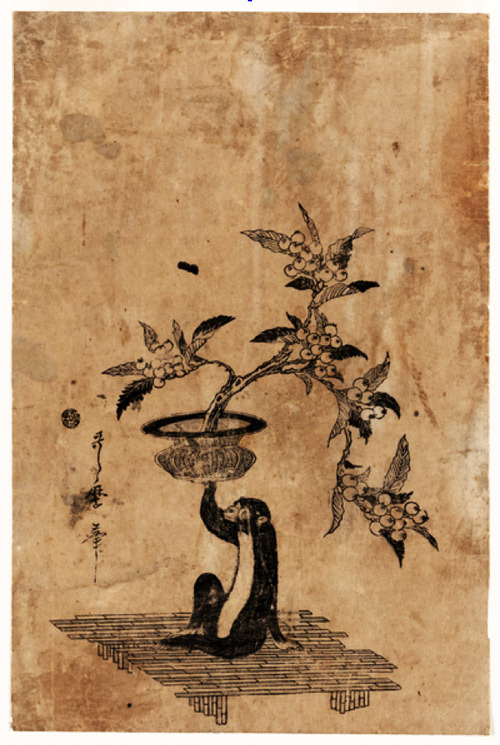 Unfortunately, this also means that the large-fruited cultivars from Japan and China are almost impossible to find. The tree simply isn't well-enough known as a fruit tree for the market to support much experimentation. Fear not, however, for even the landscape specimens make an abundance of tasty fruit. The trees are tough, basically disease-free (watch out for fire blight) and tolerate some shade. And apparently, monkeys like them. "Monkey Holding a Potted Loquat"
One caveat: in the northern half of Florida, the loquat's propensity to early blooming means you'll lose some year's crops to freezes. The tree itself is very cold-hardy, surviving all the way into zone 7... but the blooms are not. Another note: when you do end up with fruit, check it regularly for ripeness. When they start to get a little soft, harvest like mad. You seriously only get a few days to pick the tree before they start falling, rotting and bruising. My recommendation is to dry and freeze as many as possible (once pitted, of course) or juice and ferment them as fast as you can. Time is of the essence. Go out and get a few of these - they're certainly worth having. If you want a low-care fruit tree, this is it. Method of preparation: Raw, cooked, jellied. I'm in USDA Hardiness Zone 8a: 10F to 15F. I have a small, potted loquat that I brought from FL that I need to plant. If I planted it on the south facing wall of my barn could that provide enough protection to possibly give fruit?